Tottenham: Champions League quarter-finalists. You'd have been hard pushed to imagine that back in the blindness of autumn, when Spurs were conceding a late equaliser in Eindhoven that left them with a point from their first three group games. But here they are, in the last eight, and fearing no team on earth. Not after staring down the former European champions on their own turf, claiming a stirring away win after 45 minutes of pure, backs-to-the-wall defence. We expected a battle. We certainly expected Dortmund to hit them hard from the start. But in front of 66,000 fans and the iconic Yellow Wall, perhaps we didn't expect this sort of response. 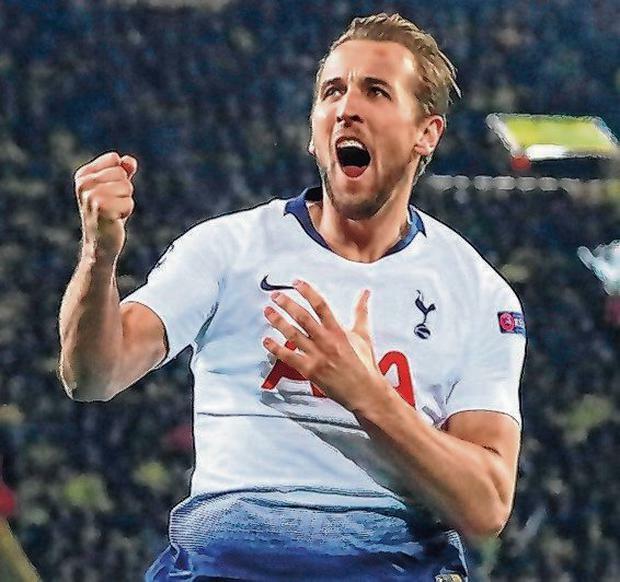 After being battered in the first half, and rescued only by a combination of feverish defending and Hugo Lloris in God mode, Harry Kane's goal on 48 minutes anaesthetised the tie with one swing, turning the second half into a procession. In the industrial heartland of Germany, Tottenham wurst-case scenario never materialised. Besides Lloris, Moussa Sissoko was one of the outstanding players on the pitch, stamping out danger and finding the time to set up the only goal of the game. Mauricio Pochettino may have grumbled in public about the amount of time his team had to prepare for this game. He may still grumble in public about the budget he has to balance. But the longer he keeps pulling performances like this out of the bag, the more hollow those excuses will sound. Dortmund went for it. A genuine five-man attack, with Mario Gotze, Raphael Guerreiro, Marco Reus and Jadon Sancho behind Paco Alcacer. Plenty of threat, but also plenty of space in behind for Tottenham to attack. First, they had to get the ball. This proved to be a far thornier problem than anticipated. 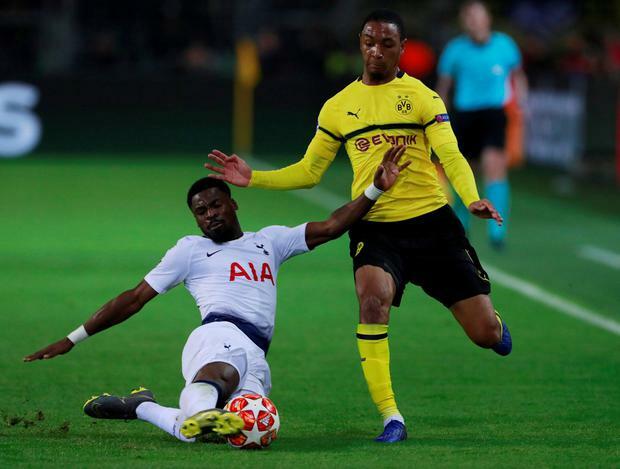 Dortmund's tempo and movement were excellent, their press well co-ordinated, their ability to move the ball through tight spaces exemplary, and before long the game had morphed into a siege. When they weren't chasing yellow shirts, Tottenham were struggling to get the ball out of their final third. Pochettino quickly withdrew Son to the left wing, a 5-3-1-1 becoming a 5-4-1. After half an hour, their share of possession was just 25 per cent. And after a peremptory clearing of the throat, the chances began to flow. Jan Vertonghen made a brilliant tackle after 10 minutes to dispossess a bounding Reus. Abdou Diallo pulled the ball back for Gotze when he probably should have shot. Lloris made two brilliant saves in succession from Julian Weigl and Gotze. Ben Davies made a heroic block to deny Reus and was mobbed by euphoric team-mates as he rose to his feet, in the way anxious parents embrace their children when they've just been rescued after 18 days trapped in a cave. This was feral, primal chaotic stuff: terrifying if you were a Spurs fan, of course, yet utterly gripping whichever side you were on. It's hard to remember Pochettino's Tottenham being outplayed quite this comprehensively in Europe as they were during the first half. And yet, what should we read into the fact that Spurs withstood it? And then managed to take the lead within three minutes of the restart? On 48 minutes, the ball ran free in midfield, and in the momentary hiatus Kane and Sissoko both reacted quickest: the former to drift unmarked into the centre, the latter to thread a first-time ball into his path. Kane was clean through, and a look and a touch was all he needed to send the ball high into the net, the tie firmly put to bed. High in the corner of the stadium, several hundred plastic steins of beer went flying. The little sliver of Spurs fans were going berserk. The knowledge that Dortmund now needed five to win giving them free rein to start dreaming of their next European trip. "Where's your famous Yellow Wall?" they taunted as the air drained out of the Westfalen like a punctured lilo. "Is this the Emirates?" They knew they had nothing to worry about here, that class and character would win out, and a hard-won three-goal advantage would be enough. But bloodlines run thick in football. And somehow, for many under the age of 40 the idea of Spurs as a major European power - as the sort of club that goes into games like this and comes out unscathed the other side still doesn't quite feel right.